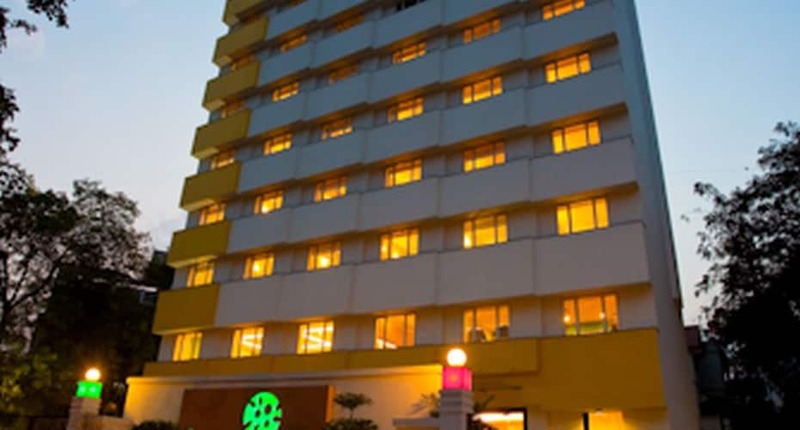 Get pampered in luxury within the finest ambience in Ahmedabad Lemon Tree Hotel, a luxurious 4-star hotel in the industrial hub of Ahmedabad, is located in Navrangpura region. Boasting of elegant accommodation options with modern amenities, top-notch facilities and peerless services, this hotel ensures ultimate comfort for all kinds of travellers. The hotel features a well-equipped gym for fitness enthusiasts. Also, it features a contemporary venue called Tangerine, for hosting business meets and conferences with state-of-the-art facilities that include Wi-Fi, LCD projector, surround sound system and a DVD player. Transportation facilities are also available. This hotel houses 99 accommodation options of different kinds that include Business Rooms, Superior, Deluxe and Executive. Specially designed rooms are available for differently abled people. All rooms feature wooden furnishings, pleasant dcor and offer spectacular views of the environs. In-room amenities include a TV, Wi-Fi, mini bar, DVD player, electronic safe, tea/coffee maker and a bathtub. Some rooms also feature a workstation. Lemon Tree Hotel features an in-house multi-cuisine restaurant Citrus Caf. The caf offers eclectic Indian and international cuisine in a beautiful ambience. Also, it hosts ghar ka khaana menu, which specializes in lip-smacking home style dishes. Local food items are also available at the restaurant. Nearby places to visit include Parimal Garden (2 km), Jama Masjid (3 km), Hutheesing Jain Temple (4 km), Gandhi Ashram (5 km), The Calico Museum of Textiles (5 km) and Gujarat Science City (11 km). Ahmedabad Junction railway station is 5 km and Sardar Vallabhbhai Patel International Airport is 10 km away from the hotel. Anar Chemical Industries (850 meters), Gujarat Apollo Industries Limited (1 km), Karan Micro Industries (1 km), Citizen Industries (2 km) and Ratnesh Metal Industries Private Limited (3 km) are near the hotel. What people love the most about this property is its great location and classy ambience. Book now and enjoy world class services at Lemon Tree Hotel, Ahmedabad. This room welcomes with happiness to offer grand comfort. The room is maintained with a Wi-Fi/broadband access; international direct dial; cable television; refrigerator; tea/coffee maker; 8-inch thick mattress, plush bath linen and premium quality bed linen. Reason For Rating : Staff needs to be more warm, chearful. What needs to improve : Good. Reason For Rating : Cleanliness, amenities, food, Good. Reason For Rating : Nice room. Reason For Rating : Good hospitality, ambience and superb food. Reason For Rating : IT WAS GOOD AND PLEASANT STAY. Reason For Rating : Business rooms are comparatively smaller and rates are high. Reason For Rating : good hotel with an excellent location. Reason For Rating : Excellent & pleasant Room service was good. What's Good: Staff were polite. Reason For Rating : Cheap pricing compared to other portals. Payment process was also simple. What needs to improve : Nothing..
What's Good: Great Location, Wonderful ambience, well maintained rooms, very good staff, Great service and yes very elaborate and tasty Breakfast. What needs to improve : Buffet Dinner spread and taste both are average and cost is high. What's Good: Mesasages or jokes displayed on walls, dining tables, etc., are wonderful. What's Good: The hotel was fine and I enjoyed my short stay. Breakfast food options were good. What's Good: Hotel location is good for visitors interested in shopping and roaming here and there. Room sizes, in room facilities are good. Breakfast is good for Indian Guests, but for international guests I am doubtful. Dinner is good on variety and food quality criterion, but it is poor on "value for money" criterion. Overall the hotel seems to be overpriced at least by 20 %. Booking process should have been better. Located in a bye-lane within the heart of the city ; comfortable and pleasant stay ; spacious,clean and hygienic ; Hotel staff were very courteous,genial and always willing to make you feel at home ; appreciate and congratulate the management as recepient of the NCPEDP - SHELL HELEN KELLER AWARDS for employing persons with speech disabilities. Nice staff and good hotel. Nearby to market and you can find autowalas from the gate. Breakfast and dinner buffet was ok. Only one thing I found the fresh juice which the hotel offered in breakfast was stale and got fermented. I would rate this hotel better if it did not have the old looks. It still have lock & key facility & the looking at the hotel I would not feel its a 4 star property, however service is good. Location is also great & somewhat in the centre of the city. Most people are business travellers & not really recommended for families, etc as there is not much for leisure. Have a look at the Room before you check-in and make payment. Choose a Higher storeyed road facing room.